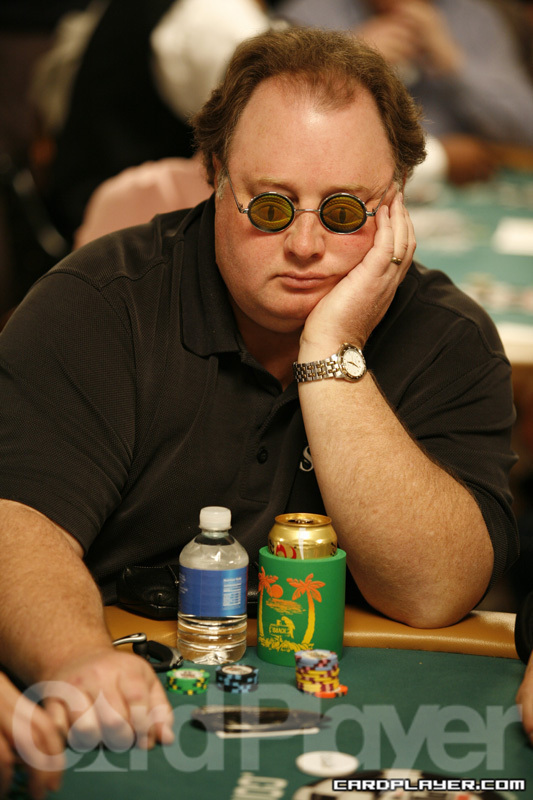 With a board of 8 6 5 A Greg Raymer checked and called a 3,600 bet from his lone opponent, who sat directly to his left. The river brought the 2 and Raymer once again checked. His opponent thought a bit before announcing that he was “giving up” and checking behind. Raymer flipped over his A K for a turned pair of aces and that was enough for him to take down the pot. The hijack raised to 700 and Greg Raymer called from the cutoff. The player on the button reraised to 2,800 and both his late-position opponents called. The flop brought the A K 9 and it checked to the button, who bet 4,300. The player in the hijack then cut out a raise to 11,000. After a short pause Raymer announced that he was all-in. The button folded and the hijack quickly called, having Raymer covered by just a few thousand. Raymer flipped over his 10 7 for a flopped flush and the hijack revealed that he had floppeda lower flush with the 6 5 . The board completed with the 5 on the turn and the Q on the river and just like that Raymer had won a huge pot, increasing his stack to roughly 65,000. Chris Leong made an appearance. Leong currently holds five cashes in Card Player Poker Tour events, having cashed three times during Season II and twice already this year. During Season II at Foxwoods Leong won the $600 no-limit hold’em, took third in the $400 no-limit hold’em and finished 52 in the $300 no-limit hold’em. For Season III, Leong finished fourth in the $400 no-limit hold’em and 14th in the $600 no-limit hold’em. Greg Raymer has a sense of humor. Raymer is currently on bullet number 3 in this tournament and recently used the ShareMyPair app to break down a hand. There are currently 51 players in flight 1B. Just as we suspected, Greg Raymer has taken his seat in flight 1b. Raymer is currently on his third bullet of the day. There are 38 players currently in flight 1B, but we expect that number to soar as the clock ticks forward. But St. Vincent did not pick up a pair of fours, or a straight, or a flush or a straight flush. The board ran out 9 Q and St. Vincent shipped 24,900 to his opponent. Terry Grimes and former World Series of Poker National Champion Ryan Eriquezzo have joined the field. Greg Raymer was eliminated for the second time today, however with registration open for flight 1 until 4:50 pm and registration open for flight 2 until 9:50 pm, we doubt we have seen the last of the former WSOP main event champion in this tournament. Flight 1 has so far amassed 177 entries with 134 remaining. In about an 45 minutes, flight 2 of day 1 will get underway and we will have the final numbers and prizepool information available once registration closes. Chris Tryba, Tom Dobrilovic and Bart Dowling have discussed walking 26 miles. Tryba said he could not walk 26 miles all at once right now, but was sure if he trained for it, he could do it in about three months from now. Dobrilovic did not seem to think he would be up for a 26 mile walk at this time either, however Dowling seemed more convinced it could happen. “Even if you are walking slow, like 22-25 minutes a mile. That would be slow,” Dowling said, seeming to imply if his tablemates took their time, the 26 miles would be doable. We aren’t sure if Dowling was attempting to place a wager on this task, but it appears that if he was, Tryba and Dobrilovic were not biting. Over on the other side of the tournament area, Greg Raymer was eliminated but quickly re-entered. Elsewhere, former Card Player Poker Tour Foxwoods final tablist Brad St. Vincent scooped up a decent sized pot by moving all-in on the river. With the board reading J 9 4 the small blind bet 500. St. Vincent called from the big blind and the two saw the 6 on the turn. The small blind checked and St. Vincent fired out 1,500. The small blind called and the dealer opened the 7 on the river. The small blind bet 2,500 but St. Vincent moved all-in. The shove was enough to force his opponent out of the way and St. Vincent scooped the pot. St. Vincent flashed the 2 as he stacked up his chips. “from level 2 day 1a @FoxwoodsPoker @CardPlayerPoker main. Didn’t think villain was ever bluffing river, but felt his range included a lot of aces up hands, plus maybe J9. In hindsight, not sure if his call on turn was to be deceptive, or timidly waiting for safe river card (not a flush card, and didn’t pair the board). Players started with 30,000 in chips and blinds are currently 50 – 100, meaning that a starting stack comes with 300 big blinds for now. That’s a lot of play! As a result it will probably be a while before players start getting in large percentages of their stacks. Most pots for now will probably look somewhat like the following, won by Greg Raymer. With a limper already in the pot the player in the hijack raised to 500 and the cutoff called. Raymer made it 1,300 to go from the big blind, the limper folded and both late position players called. The flop brought the K Q 5 and Raymer lead right out for 2,600 and quickly got folds from all remaining opponents. He raked in the pot to keep rebuild his stack to just below the starting amount. The final day of Event No. 50 ($2,500 Six-Handed 10-Game Mixed) begins with 20 players from the initial field of 372 and they will be playing down to a champion tonight. Cards get into the air at 2 p.m. and that’s when the remaining field will begin to march down to the final table. Notables still in the hunt include Robert Williamson III, Konstantin Puchkov, Greg Raymer, Mike Wattel, Tom McCormick, and Bruno Fitoussi. Card Player will bring you level-by-level updates with chip counts and payouts once the official final table begins with the final six players in the event. Tune back in at that time to see which player will walk away with the top prize of $220,061 and a World Series of Poker gold bracelet. NOTE: Play ended last night with 9 players spread out over two tables and resumed today at 3:00pm. John Juanda started the day as the short stack and managed to double up through Greg Raymer early on with a pat 9 against Raymer’s pat 10. Juanda then made a run at the chip lead amassing over 500,000 at one point before surrendering a huge pot to Richard Ashby which put Ashby on top and dropped Juanda down to about 350,000. Raymer on the other hand wouldn’t be so lucky as he was eliminated in 9th place ($27,928) after Raymer paired jacks against Juanda’s made ten. With Raymer’s 9th place elimination, the final eight players have consolidated to one table where one more player will need to be eliminated before the official seven-handed final table is set. Be sure to check back hourly for level-by-level updates until a champion is crowned. After winning a crucial coinflip, Greg Raymer had Mike Matusow on the ropes and looking for a double up. Matusow moved in blind with Q 8 and Raymer looked him up holding K 9 . The board came 9 8 5 5 6 and Matusow hit the rail. Raymer will now face the winner between Tom Marchese and Phil Gordon in the next round. The hijack raised to 700 preflop and the big blind and Jonathan Aguiar made the call on the button. The flop fell A 4 2 and the hijack bet 1,100. Aguiar made the call and the big blind mucked. Both players check the J on the turn and also the 5 on the river. The hijack flipped over K J and Aguiar mucked. Cody Slaubaugh raised to 750 preflop UTG+1 and Tony Cousineau made the call from the big blind. The flop fell 7 6 5 and Slaubaugh bet 1,200. Cousineau made the call and then both players checked the 6 on the turn. The 9 followed on the river and Cousineau bet 3,000. Slaubaugh made the call, but he mucked when Cousineau revealed A 3 for the flush. Four players saw a 8 7 3 flop for a 1,300 entry fee. Soi Nguyen raised to 3,500 after an initial raise worth 1,000. One opponent reraised enough to force Nguyen to make an all-in call. Nguyen made that call with pocket aces but he quickly found out he was in a terrible predicament when his opponent turned over pocket threes. Nguyen was eliminated after the turn and river brought bricks. Raymer doubled up on the hand to get right back to where he started with 30,000. Team PokerStars pros Greg Raymer and Arnaud Mattern just dueled in a pot. The flop read 9-7-4 with two clubs and both Raymer, Mattern and one other opponent checked through to a jack on the turn. The small blind bet 4,000 and Raymer raised to 15,000. Mattern moved all in and the small blind mucked. Raymer made the all-in call and flipped over K 10 . Mattern held J 6 . The river brought a club, giving both players a flush, but Raymer held the better one and he double up to 90,000. Rockets for "Big Mick G"
On a board of J 7 5 Mick Graydon, also known as “Big Mick G”, bets 5,500 from late position. Greg Raymer raises it to 1,500 from the button. Graydon calls and the turn is the 4 . Both players check and the river is the 7 . Graydon bets 12,000 and Raymer, after some thought, calls. Graydon shows A A and Raymer says, “Woah pocket aces and you turned a flush draw!” He then goes on to say, “At least now I know. You shove the turn and I fold, then I wouldn’t know and I’d feel bad.” Graydon now has 70,000. The cutoff bet 900 preflop and David Steicke made the call from the middle position and Team PokerStars pro Greg Raymer also made the call from the late position. The flop fell 9 5 3 and all three players checked. The 8 fell on the turn, Steicke bet 1,750, and Raymer made the call. The cutoff mucked and the 5 fell on the river. Both players checked and Steicke turned over A 10 . Raymer mucked and his stack is still strong with 45,000. Steicke was up to 36,500 after the hand. 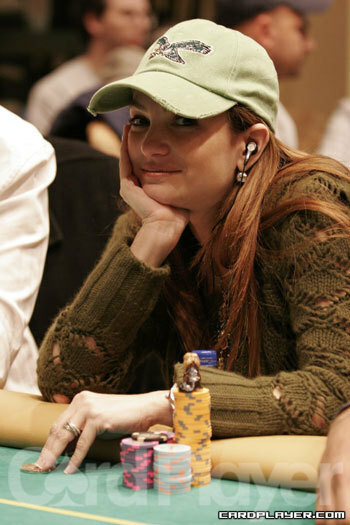 The player on the button put in a raise and Beth Shak reraised to 1,050 from the small blind. Action folded back to the button who made the call. The flop ran 8 Q 6 and Shak fired 1,500. The button thought more a moment before letting his hand go. Shak had around 31,700 after the hand. After a raise and reraise preflop, Ductch Boyd and Pierre Neuville saw a flop of 2 2 4 . Neuville led from the small blind for 1,050 and Boyd quickly made it 3,150. Neuville disgustedly threw his cards into the muck and Boyd stays right around their starting stack. Chad Batista made a raise to 275 from early position and called a three-bet to 875 from a player in middle position. The flop came 10 Q 9 and both players checked. The turn was the Q and Batista checked again. His opponent bet and Batista made a check-raise to 2,500 and his opponent quickly folded. Picking up the action after the board had run out 8 7 3 4 A , Michael Mizrachi fired 2,000 into a pot holding 7,000. His opponent in seat 6 tanked and then threw in the call. Mizrachi tabled K K and seat 6 mucked. Mizrachi took the pot and he was at 40,000. Greg Raymer moved all in for his last 2,600 and the next player shoved. Other players in the hand mucked and Raymer was isolated. The board ran out K 10 2 7 6 and Raymer could not crack aces to save his tournament life. A player raised to 300 and John Hennigan called. The small blind reraised to 1,800 and Hennigan was the only caller. The flop was J 8 3 and both players checked. The turn was the 9 and the small blind bet 2,025. Hennigan would have none of that nonsense as he raised to 5,100. His opponent mucked and Hennigan took the pot. He was at 38,000. Picking up the action on the flop, the board read Q 9 7 . Nick Schulman bet 1,200 and Hunter Frey made the call. The turn was the 4 and Schulman shoved for his last 6,550. Frey made the call with A Q but was trailing Schulman’s K K . That all changed when the river brought the Q , giving Frey trips and booting Schulman out the door on the first level of play. Picking up the action on the flop, the board read Q 10 2 . Greg Raymer moved all in for 23,225 and his opponent in seat 3 made the call. Raymer was drawing to a flush while his opponent had middle set. The turn was the 8 and the river was the 5 and Raymer was down to just 1,200 chips in the early going. Chino Rheem raised to 250 from under the gun and three players made the call. The four players saw a flop of 9 4 2 . Rheem bet 650 and only two of his opponents made the call. The turn was the 6 and Rheem checked. One player bet 900 and was called by the other opponent. Rheem then popped it to 3,000 and both opponents made the call. The river was the 7 and Rheem led out with 4,400. Only one opponent called but Rheem simply tapped the table as he was shown 4 4 for a set. Rheem was down to 22,000. Picking up the action on the flop of 7 7 4 , Nick Schulman bet 1,150 and his opponent made the call. The turn was the 6 and Schulman bet 3,500. His opponent made the call again and the river was the J .
Schulman bet 8,000 and his opponent sprung his trap as he raised to 20,200. Schulman thought for a bit before mucking his hand. His opponent tabled 6 6 and Schulman was down to 15,000. After the under-the-gun player raised to 300, a middle position player called, and Greg Raymer movedl all-in for 1,025. Both opponents called and checked down a board of J 2 Q 7 10 . “Please nobody say straight,” said Raymer has he flipped up 7c7s. Neither could beat it and he is up to 3,225. Nick Schulman’s stack dropped to 10,000 after betting every street on a board of 5 6 2 8 9 . He bet 400 on the flop, 1,100 on the turn, and 2,200 on the river. His opponent check-raised to 6,300 and Schulman let it go. There are 120 tables in the Amazon Room going and there are 15 tables in the Pavillion. Those tables are breaking fast and soon all of the players will be playing in the Amazon Room. They will be playing 10-handed early on so we can estimate there are roughly 1,200 players in action on Day 1A. Registration is open until the end of the second level and then we will be able to get an official count on the day. Erik Seidel was all in by fifth street against Marco Traniello. Seidel was able to make a 9-8 low on sixth street, but it was squashed by Traniello’s 9-7 made on sixth street as well. The river did not improve Seidel’s hand and he was eliminated. Traniello was up to 163,000 with the knockout. Greg Raymer and John Hennigan tangled in a pot that saw Raymer all in by fifth street. Raymer made a 10-low, but Hennigan was able to squeeze out a 9-low and Raymer made his exit from the tournament. Chen completed on third street and Richey raised to 10,000 and Chen called. Chen then led out on fourth and fifth street with Richey calling him down. On sixth street, Chen bet again and Richey could not call. He mucked his hand and was left with 11,000. Chen was up to 90,000. Marco Traniello completed to 5,000 and Magnus Persson made the call. Traniello led for 5,000 on fourth street and Persson called. Traniello then led for 10,000 on every street after and Persson called him down, showing 3 5 8 K .
Traniello tabled (5 4 3 )A Q 2 J for the wheel and scooped the pot as Persson mucked his hole cards. With the pot Traniello was up to 240,000 while Persson was virtually crippled with 60,000.